Product Description Accurate jar testing is one way to help produce the highest quality water possible, as economically as possible. The consistently reproducible results obtained by Phipps & Bird Jar Testers assist water and wastewater treatment plants in determining the optimal dosing for their specific conditions. 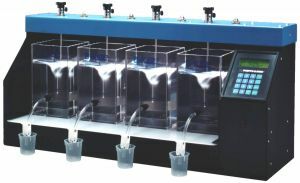 The PB-900 Programmable four-Paddle JarTester uses four operator-programmable memory banks that offer virtually unlimited stirring capabilities. Each memory bank may be programmed with paddle speeds from 5 to 300 rpm in 1-rpm increments and run times from 1 second to 59 minutes, 59 seconds in 1-second increments. Turning the stirrer off does not erase the programmed information. The stirrer may be run independently in any one of the memories, continuously at a selected speed or sequentially through the memory banks. Running it in `sequential mode' permits automatic transitioning from a fast mix/short run to a slow mix/long run, or any combination or speeds and times desired to replicate actual plant conditions and operation. Four stainless steel 1" x 3" paddles are spaced six inches apart and are adjustable to a maximum depth of nine inches. The PB-900 comes complete with a fluorescent lamp floc illuminator built into the jar tester base to provide soft, diffused lighting of samples being tested. Each unit comes complete with four standard, round, glass, 1-liter laboratory beakers. If you want four B-KER2 square, acrylic, 2-liter testing jars, please request the additional cost.